PSD2 - What changes will you notice? On February 19 this year, the revised Payment Services Directive 2 (PSD2) regulations officially came into effect in the Netherlands. These measures do not come as a surprise, since the legislation had already been in force at EU level since January 13, 2018. It goes without saying that Mollie is in compliance with all guidelines in the PSD2. But what do these guidelines mean for you and your business? Today, Mollie and Frontend Studios announce their new plug-in for plentymarkets. The Mollie plug-in for plentymarkets makes integration simple and time efficient. Last month, we released the new Onboarding API for our merchants. It makes it possible to prefill data in the dashboard's onboarding screens for newly registered merchants and to follow their progress. Releasing this API was the last major step in our partner improvements epic. Together with other small enhancements, like pricing, enable/disable payment methods, and metadata for orders. The Belgian market is very important to us. It was the first foreign market we expanded our business to and therefore has a special place in our heart. Three years have passed since we made our first step into the Belgian market and it has been a great success: the amount of Bancontact transactions processed by Mollie increased with 178% last year alone. As businesses grow internationally and acquire more foreign customers, it’s important to adjust accordingly. After all, international customers have different needs and expectations. To advance international opportunities we are now offering the option to localize your checkout. Today, we’re announcing the addition of a new payment method to Mollie’s products: gift cards. Starting today, all merchants who have an agreement with one or more of the supported gift card brands, can accept online gift card payments through Mollie. Mollie currently supports the most used Dutch gift card brands: Nationale EntertainmentCard, Webshop Giftcard, Podium Cadeaukaart, VVV Giftcard and YourGift. If you are a licensed retailer for any of these issuers, integrating them into your checkout is as easy as turning on the payment method in your Dashboard Settings. If you’re a retailer for multiple supported gift cards brands, using Mollie allows you to accept them all through a single integration. Consumers who choose to pay for their purchases using gift cards, enter the card number and, if required, the PIN which is found on the card and might be hidden behind a scratch-off layer. Using gift cards, consumers can pay partial or full amounts. If there’s a remaining amount, another gift card of the same brand can be redeemed or any other activated payment method can be used. As always, we only charge you for successful transactions. The cost of a successful gift card transaction is 0,25 EUR. Not a licensed retailer yet? There’s a lot of advantages to it. 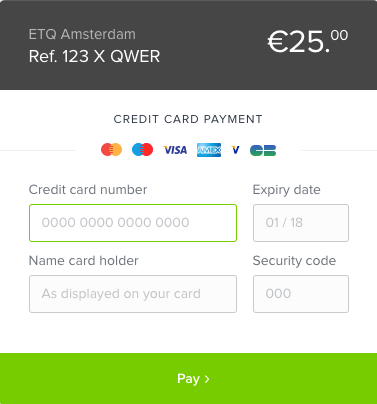 The Dutch gift card industry saw a turnover of more than 2 billion EUR in 2014 And a 2015 report by the Dutch tourist office found that 41% of consumers spend more than the gift card’s worth when they redeemed it. Adding gift cards as a payment method also amplifies your reach in your specific market through exposure from the gift card issuer. To use the gift card payment method, you’ll first need to enter into an agreement with one or more issuers. Payouts are handled by the issuers as well. Click here for more information about the payment method.